We use two kinds of projectors at Wilmslow Guild and in the Photographic Society. The earlier Sony projectors project an image on the screen that is 1024 pixels wide by 768 pixels high. (A pixel is a picture element.) This image size is termed XGA or eXtended Graphics Array. XGA provides only about 0.75 megapixels, which is much less than the image size of many current digital cameras, which are typically about 6 or 8 megapixels. The image projected by the newer Canon XEED SX60 projector can show an image that is 1400 pixels wide by 1050 pixels high. This size is termed SXGA+ or Super eXtended Graphics Array plus. However, even SXGA+ provides only about 1.5 megapixels, which is still very low. Much of the detail of the original image cannot be seen in a projected image. An image from an 8 megapixel camera in 3 x 2 format will have about 3500 pixels across its width and about 2300 pixels in its height. Current digital projectors can show only about one third as many pixels across the width or in the vertical direction. Moreover, although the SXGA+ frame has nearly twice as many pixels as the XGA one, the linear resolution is only increased by 1.37 times (1400/1024). The number of pixels in the SXGA+ frame is 1.87 times as great as the XGA one, but that does not raise the resolution as much as one might think. Many other factors influence digital image quality. These projectors — and many others — have an image frame in the proportions 4 x 3 (width x height). The 35mm film frame is usually 36 mm x 24 mm, in the proportions 3 x 2. 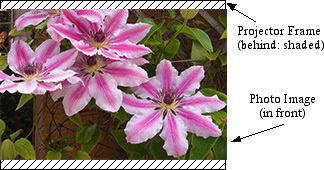 Many digital cameras use the same frame proportions of 3 x 2. In the figure above the shaded rectangle represents the image frame of the projector, in the proportions 4 wide by 3 high. The image behind represents a normal camera photograph in the proportions 3 wide by 2 high. The two images have been scaled so that they are the same height as the projector frame, so that the full height of the photograph can be displayed. However, the two bits of the photograph visible at either side lie outside the projector’s image frame. Hence they are not displayed. Instead we might scale the photograph to fit within the width of the projector’s frame. The figure shows the same projection image frame as the shaded rectangle, but it is now shown behind. The photograph has been resized so its width just fits within the projection frame. The height of the photo image is reduced to maintain the same proportions, of course. The shaded bits at top and bottom of the projection frame are now unused. The whole photo can be viewed, but the image is projected at a slightly smaller size. For optimum image quality you will wish to size your images to fit the size of the projector that is to be used. Then the pixels that you provide will be the ones that are projected. You could leave this adjustment of size to the software that is used to drive the projector, but you would have no control over the quality of that transformation. You might also want to crop your images to make optimum use of the pixels that are available in the projected image frame. In a 35 mm slide projector the slides may be landscape or portrait: one simply rotates portrait slides so that they are shown upright. This is not possible with digital projectors. Portrait images cannot exceed the frame height. A portrait image in 3 x 2 format might be 512 pixels wide by 768 high in the XGA frame. It cannot be 768 pixels wide and 1024 pixels high. (In SXGA+ the same image might be 700 pixels wide and 1050 pixels high. It cannot be 1050 pixels wide and 1400 pixels high.) Do take care to avoid this trap. For many competitions, both within the Society and externally, the organisers may specify that all images must conform to a specific image size. Other sizes are not usually acceptable, and may be rejected in competitions. WGPS competitions are usually SXGA+.